modern kitchens, spacious bedrooms, bathrooms and peaceful terrace on which you can have a quiet supper or glass of wine coming from famous peninsula Pelješac vineyards. 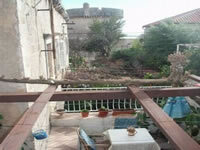 Both apartments*** have private entrances with an atmosphere of the safety and security as your own home. 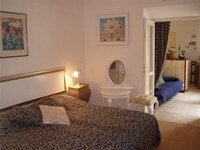 By choosing Stella Chapel's apartments you avoid the cost of busy and crowded streets in the Old Town. What our accommodation can guarantees is that no matter who are you, or where you come from, with us your vacations will be filled with satisfaction. Large studio apartment has approximately 37 meters square, with own outdoors, apartments has air conditioner, TV, private entrance, kitchen supplied with coffee, tea, sugar, oil, salt and dressing... and common large terrace 40 m square. Reservation on request. 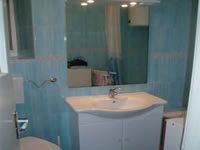 It fits out with modern new bathroom with shower, kitchen, Sat-TV and air-conditioning, is suitable for 2 persons. 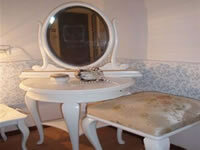 The double beds, which can also be used as single bed, are of high value and quality, made by a joiner. At the living room area you can find a very comfortable sofa. 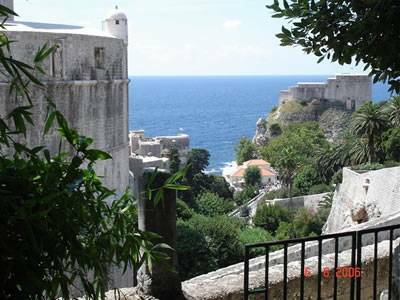 Just few minutes away from the Old City od Dubrovnik facing the famous mighty tower MINCETA - from the terrace -100 meters as the crow flies. Ideal location - only 100 meters far away from the Town - walking on Zagreb road and enjoying the City Walls you will be in the Old Town. If you use Ploče gate there are NO STAIRS AT ALL ... deference situation is using the Pile gate. The tourists should know that more or less Old Town is surrounded with beautiful houses, gardens, apartments but they are above the Town and the steps are inevitable... even inside the Town. Choosing to be in the Old Town you have to take a risk of noisy street from cafe bars or early in the morning from the market place and shops. This private accommodation features modern kitchens, spacious bedrooms, bathrooms with showers-bath and peaceful terrace on which you can have a quiet supper or glass of wine coming from famous peninsula Pelješac vineyards. 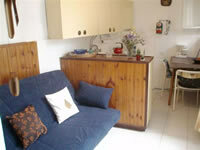 Both apartments have private entrances with an atmosphere of the safety and security as your own home. POSAT and NAUTICA EXSLUSIVE **** restaurants - PILE GATE -I would like to recommand to try a dessert; Dubrovik's rosata cream, with few drops of rose de oil. STEAK HAUSE DOMINO**** - ŠIROKA (WIDE STREET) – Finest place where you can relax and enjoy specialties of the Dubrovnik region, or if you prefer internacional deshes. Deposit is not requested prior to arrival: After confirming your reservation, you will be contacted by Stella Apartments. Thank you for your booking at Stella apartments; My address is ZA KEPELICOM 16 – BEHIND THE CHAPEL 16, corner of Bernard Show street. * * If you are coming from the airport with TOUR COACH (35 kunas), than you have to ask the driver to stop on ILINA GLAVICA - get off and start walking 100 meters on Zagreb road towards KAPELICA. Or proceed to the bus stop - Pile Gate – you will see the HILTON HOTEL across the road; once you get of the bus turn right and you will see the stairs (along palm's trees): UZ POSAT, or if you would like to avoid the stairs you can take the option of the street behind the City Walls and come up on Zagreb road – to KAPELICA ( 8 - 10 minutes walking ). From Pile and Main bus station taxi cost's 80. 00 kuna's - from the airport cost 250. 00 kuna's to KAPELICA. ** If you are coming from Main bus station or Principal Marine terminal -GRUZ, take the bus NO. 8 and ask bus driver for KAPELICA i. e. Pinky bar bus station - get off…than prossed walking 50 meters down the Zagreb road until you see small chapel on left side, and on the right Old Town! ***If you are driving by car from SPLIT – after passing Dubrovnik bridge, drive toward OLD TOWN, than pass throuhg small tunnel, at the crossing (traffic lights) turn on the left - prossed driving 50 meter down on Zagreb road until small chapel and first sight of Old Town. The bus tickets can be both in the bus; the price is 10 kunas, or 8 kunas at the new's kiosk - ( 1 euro) - ticket duration is 1 hour. Driving lasts 10 -15 minutes towards Old Town. Price for parking place in the first zone - Old Town is 10 kuna's per an hour, but you can par your car 50 meters up on Zagreb road in Public garage - one day 120, 00 kuna's. Mybe, if you SMS me 0038598427969 on your arrival so I could help out to finde the way and wait for you…!Or ask taxi driver to call me (and drive you to KAPELICA not to PILE), and please, be aware of peoples or even taxi drivers who might offer you some other accommodations for lowers price but questionable quality!? Also, please cancel your reservation 24 hours before your arival if you have to! I am looking forward to the pleasure of your visit. Local bus, Airport, Principal Marine terminal and Bus station - Gruz.